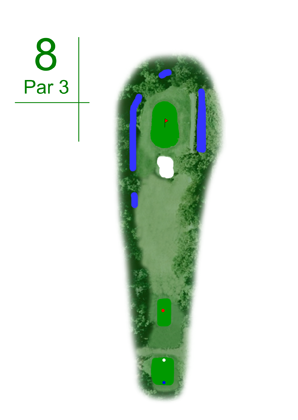 A classic par 3 hole. A very pretty but difficult hole that gets the knees shaking on the tee shot. You have to hit a good shot as the green is small and protected by a deep bunker short and water left, right and back. Jack Nicklaus after playing the hole said never change this hole. Good luck, take a deep breath and for the religious appeal to the higher body for assistance.